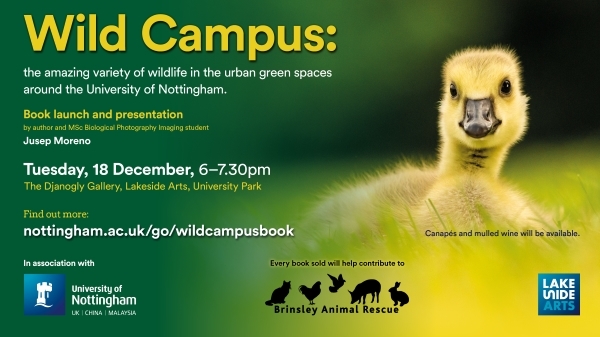 Join us at the launch of ‘Wild Campus’ — a new book exploring the amazing variety of wildlife in the urban green spaces around the University of Nottingham. Wild Campus is the first photo book to capture the remarkable range of wildlife seen around University Park campus and adjoining Highfields Park. Authored by Biological Photography and Imaging MSc graduate Jusep Moreno, the book started life as a piece of coursework which captured the character of the campus. The 102 page book focuses on different aspects of the #BeastsofUoN, including water wildlife, night wildlife and the importance of urban spaces for wildlife and people. The book launch event, taking place 6-7:30pm, Tuesday 18 December 2018 at the Djanogly Gallery, Lakeside Arts, will include photographer and author Jusep Moreno speaking about his motivations to focus on University park campus and how he achieved the astonishing shots seen in the book. Find out more and book your place at this event: nottingham.ac.uk/go/wildcampusbook. We attended the book launch and thoroughly enjoyed the event. however we were bitterly disappointed and offended by the food and drink on offer. I attended along with 4 of my vegan friends, we were very disappointed that firstly the event was celebrating animals, but the food on offer was only animals and animal products. I asked the caterers if there was any vegan food and they seemed to be very ignorant of the terms. hey were also unable to confirm if the drinks were vegan or contained animal products.